As a child in Los Angeles, I watched European starlings bathe in gutter puddles, admiring their gleaming feathers and quick bright eyes. Field guides and birdwatchers say starlings perch on the lowest rung of the ornithological ladder, thanks to their tendency to invade both cities and fragile habitats, pushing out native birds and decimating farmers’ crops. But I didn’t know that then. In ignorance, I marveled. Wolfgang Amadeus Mozart had a starling, purchased for a few coins in a Viennese pet shop; he kept it as a companion and — possibly — a muse. 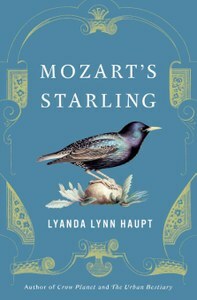 The unlikely relationship between musical genius and avian pariah has been the subject of essays, public radio features, and now Mozart’s Starling, a work of literary nonfiction by Lyanda Lynn Haupt. A Seattle-based naturalist and the author of Crow Planet and Urban Bestiary, Haupt tells three stories in her newest book — a trio of deftly interwoven tales that point toward a new way of seeing species we long ago learned to revile. As in her previous works of nonfiction, Crow Planet and The Urban Bestiary, Haupt asks us — gently and with contagious delight — to reconsider the animals we disparage. Listen to her, and even the most pedestrian walkways sing out with possibility. Starlings — like house sparrows and racoons and nutria — are here to stay despite our best efforts to eradicate them. These familiar birds are a gateway creature, if you will, allowing almost anyone anywhere to become acquainted with and attuned to a species other than ours. Haupt begins with Mozart, describing how the composer discovered the bird, unaccountably whistling a motif from a piano concerto of his that had not yet been publicly performed. Haupt delves into this mystery and others, armed with history and science. She journeys to Vienna and the Mozarthaus, where the composer and his family lived between 1784 and 1787, to see for herself the rooms made sweeter by the presence of a species with an extraordinary capacity for song. European starlings, Haupt explains, are natural mimics. “It is a surprise to most contemporary Americans that starlings can talk, that they are gifted mimics of environmental sounds, other birds, music, and the human voice,” she writes. And they’ve managed to spread across North America and around the globe. The second story in the book is her own — the entertaining tale of how Haupt, a former wildlife rehabilitator, and her husband, Tom Furtwangler, snatched a baby starling from a nest in a Seattle park before city exterminators arrived. They nurtured the hatchling and raised it to adulthood, a process Furtwangler captured in whimsical black-and-white photos. With a rehabber’s necessary wit, she recounts stories of the bird nestling in her cleavage, pooping in her hair, vanishing and being found at last, having flown into the refrigerator. 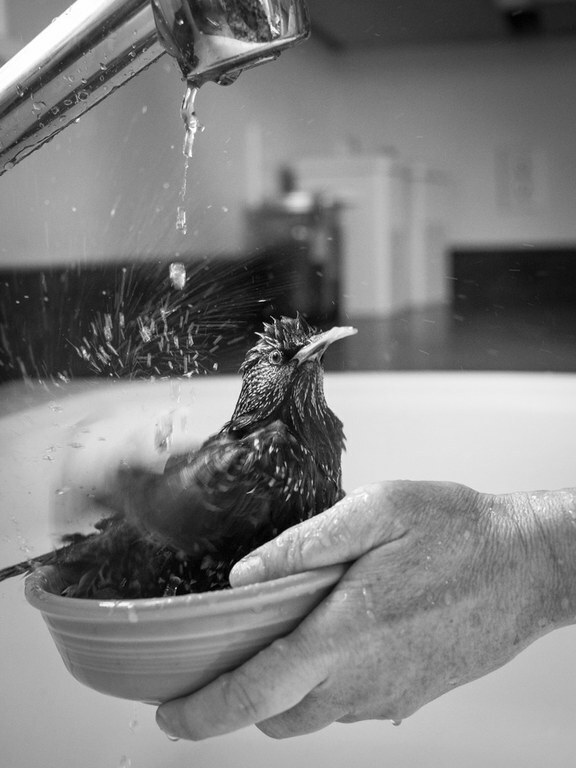 Carmen, the pet starling of author Lyanda Lynn Haupt, takes a bath. Haupt’s book is the latest addition to an unusual subgenre. Over the past quarter century, authors have penned shelves full of books about sharing their home with a wild bird: Bernd Heinrich’s One Man’s Owl, Martin Windrow’s The Owl Who Liked Sitting on Caesar, Helen Macdonald’s H is for Hawk, Robbyn Smith van Frankenhuyzen’s Adopted by an Owl, and the late Oregon author Chris Chester’s magnificent Providence of a Sparrow. Like Chester, Haupt shows how, by studying a creature long regarded as a nuisance, we may cultivate a gracious appreciation for the ordinary and the inevitable. Her portrayal of Carmen returns to me something that’s been missing for decades: a receptive respect for the wild creatures that were available in my cement and asphalt childhood. Who are any of us to say, really, that a California condor glimpsed on a backpacking trip or a resplendent quetzal spotted on a Costa Rican tour has more innate worth than a bird possessed of over 30 song types, one resourceful enough to exist on dumpster crumbs and bathe in urban gutters?